“In the real world, sounds originate from all directions, not from a single horizontal plane (as per contemporary 5.1 and 7.1 channel systems). An added sense of realism can be achieved if sound can be heard from overhead. Think of the example of a static overhead sound, such as an insect chirping in a tree in a jungle scene. In this case, placing that sound overhead can create greater listener envelopment within the sound scene, as opposed to this sound emanating from the two-dimensional sound stage. 5.1.2 or 7.1.2: Overhead speakers should be positioned at approximately 80 degrees from viewing position, and slightly ahead of it (see figure 11 and 17 from previous link). 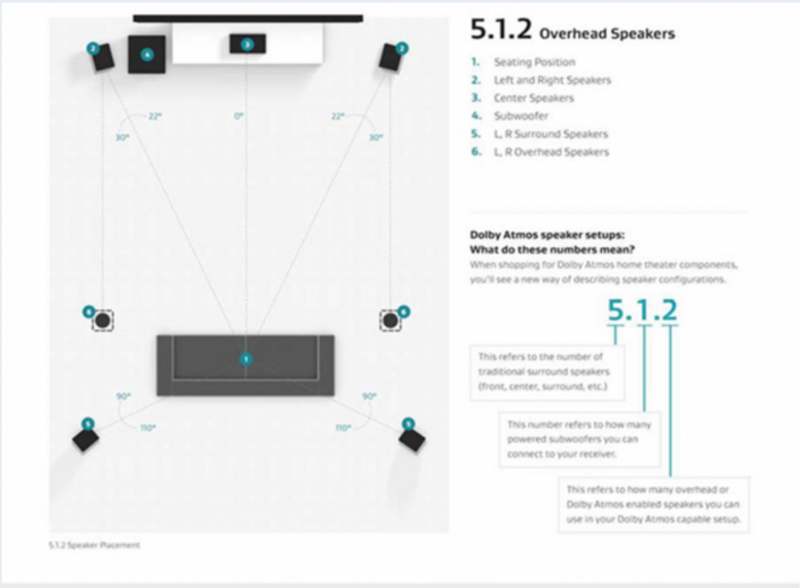 5.1.4 or 7.1.4: Overhead speakers should be positioned at approximately 45 and 135 degrees from viewing position (see figure 13 and 19 from previous link). Figures for dispersion patterns are not often available from speaker manufacturers however a good quality model would certainly comply with the designated frequency range, and also in terms of off-axis dispersion. 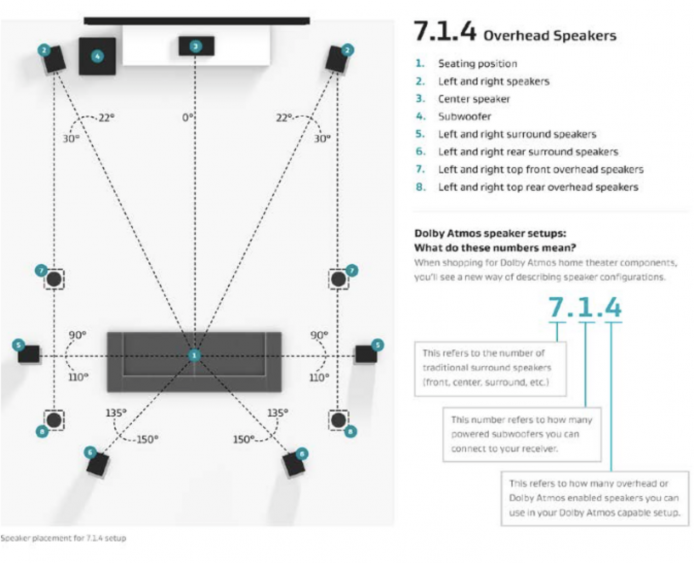 It is useful to note that Dolby appear to have taken a common-sense approach and allowed some room for manoeuvre when installing ceiling speakers as part of an Atmos system. This is excellent news as not everyone is fortunate enough to be creating a bespoke home cinema room in their home, and flexibility is key when attempting to integrate any speaker system into a domestic environment.